** PLEASE NOTE THIS IS A DOWNLOAD VERSION ** This means that we email you the game within 24 hours and you need to print it out on your printer. You WILL NOT receive a boxed product of the game. The famous millionaire businessman, Rudolph Rams-Bottom, was preparing to celebrate his 80th Birthday. He had invited his family and relations to his newly acquired country house, Ewe Tree Hall, to celebrate with him. Before the celebrations commenced, he had shocked everyone with the announcement that he planned to step down as head of the family business and would announce his successor by the end of the night. A few hours later and several miles away, a popular but relatively unknown police officer by the name of Detective Sammer was just preparing to go home for the night when the call came through. A body had been found at the Rams-Bottoms home and it appeared to be murder! Detective Sammer was on the scene within minutes and held everyone at Ewe Tree Hall, pending the investigation. What guilty secrets were people hiding, who would resort to murder to keep those secrets hidden and most importantly, can Detective Sammer bring the killer to justice? 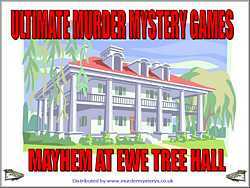 All will be revealed in 'Mayhem at Ewe Tree Hall'. This game is replayable many times. The host picks the murderer, and the victim and specifics of the murder scene associated are then revealed at the party. Some conversations between characters may be irrelevant, but listen carefully as others may hold a clue to the murder.